The Silver Trail subdivision is a new home community located in Kuna, Idaho. “Located in one of the fastest growing areas of the Treasure Valley, Silver Trail affords tremendous value while keeping you close to town.” New home prices starting at $212,480. Welcome to WeKnowBoise.com where you can research Silver Trail real estate market information and find homes for sale. View the latest new homes, open houses, recently sold homes and reduced-price real estate in Silver Trail. Looking for new homes in Kuna Idaho? Browse our complete guide to new Kuna subdivisions and find the perfect place to call home. 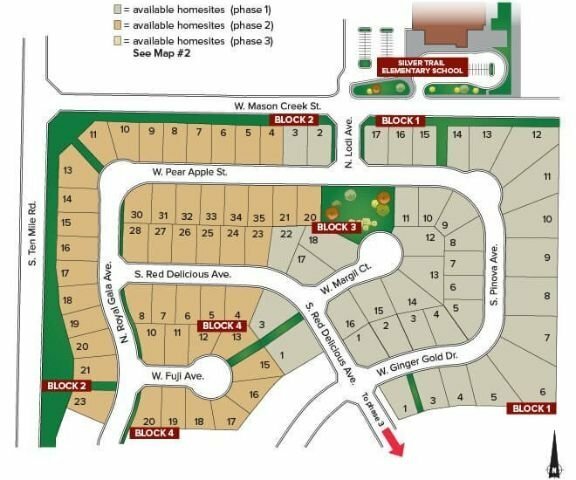 86 building lots ranging in size from 0.13 acres (5,660 sq ft) to 0.406 acres (17,690 sq ft). From I-84, take Exit 42 South (Ten Mile Rd) past W. Columbia Rd. Turn left (east) on W. Mason Creek St, Kuna, ID 83634. Looking for the best neighborhood to call home? We can help, contact us online or call (208) 391-4466 and see for yourself what hundreds of happy Kuna real estate owners already know.